Maybelline Color Sensational Matte Metallic Lipstick in über chic, über fashionable shades. These gorgeous lipstick shades will have you reaching for one of the colors almost daily. I can't keep my hands off of these they are so beautiful. I love how metallic they are but have the matte component to them. From Hot Lava and Copper Spark to Gunmetal and Silk Stone, get the matte metallic look with Maybelline’s new supremely sensational, highly pigmented, matte metallic lipstick. It comes in 10 super-saturated shades. Take one swipe to get powerhouse color that lasts for hours. Here are the shades as they look on my mouth without any lipliner underneath. I thought it would be best to show you this way, so you can see how they look on. I tried on each shade and then took a photo. above, left to right: White Gold, Pure Gold, Silk Stone, Molten Bronze, Hot Lava, Smoked Silver, Copper Spark, Serpentine, Gunmetal and Copper Rose. 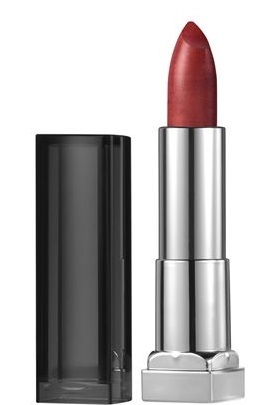 Maybelline Color Sensational Matte Metallic Lipstick is available at mass market locations including such as Walgreens, Rite-Aid, and CVS/Pharmacy and www.ulta.com and Ulta Beauty locations. Like Maybelline on Facebook: https://www.facebook.com/maybelline; Follow Maybelline on Twitter: @Maybelline; Follow Maybelline on Pinterest:http://www.pinterest.com/Maybelline/; Follow Maybelline on Instagram:http://instagram.com/maybelline# and Follow Maybelline on Tumblr:http://maybelline.tumblr.com/.